For freight brokers, the story in the first quarter of 2019 was one of relatively normal freight volumes, loose capacity and margins that widened even as brokers bid aggressively on contract freight and undercut asset-based carriers. Take J.B. Hunt?s (NASDAQ: JBHT) brokerage, Integrated Capacity Solutions (ICS), as an example. Hunt reported first quarter earnings on April 15. ICS posted volume growth of 15 percent year-over-year in the first quarter, but revenue per load dropped 11.5 percent to $1,041. In other words, ICS grew its volumes by cutting prices by double-digits. Still ? and this is why market conditions were so favorable for brokerages this past quarter ? ICS was able to widen its gross margins from 14.4 percent in the first quarter of 2018 to 16.5 percent in the first quarter of 2019. Even as JBHT?s brokerage scooped up contracted volume and undercut the low single digit contract rate increases asset-heavy carriers were calling for, it didn?t chase the market all the way down and actually widened its gross margins. That largely tracks with the information FreightWaves reporters have heard from smaller, privately held freight brokerages in conversations over the past two weeks. ?Volumes are up, capacity is abundant and capacity is up more than volumes,? said Jamie Teets, CEO of Chicago-based brokerage Transportation One. ?With that in balance, it?s very easy to source capacity. Right now is a good time not to be chasing the lowest-priced carrier, but to be building relationships. The market has allowed us to find well-priced capacity but also get service.? Part of the reason why Transportation One?s volumes are up is because the company is still in high-growth mode with plans to grow gross revenues somewhere between 75 and 100 percent this year. On a national basis, freight volumes are off 2018 levels by about 3.5 percent. Only a few regions in the country currently have tightening capacity, although brokers expect that to change any day now. ?It?s the Southeast, especially south Florida and south Texas ? reefer capacity is the tightest in those markets,? Teets said. Indeed, according to DAT?s RateView tool, reefer spot rates excluding fuel out of those markets are elevated. Reefer rates from Laredo to Dallas averaged $2.43/mile in March and are trending at $2.55/mile over the past seven days; from Miami to Atlanta reefers took $1.25/mile in March, but have charged $1.47/mile over the past seven days. On the volume side, markets like San Antonio, Tallahassee and Miami have woken up. San Antonio volumes are up 42.89 percent compared to 30 days ago (OTVIM.SAT); Tallahassee grew 21.24 percent over the past month (OTVIM.THL); and Miami volumes rose 12.96 percent compared to a month ago (OTVIM.MIA). As produce and food and beverage volumes grow and book reefer capacity, there could be a knock-on effect in dry van capacity. Reefers often haul dry freight in the off-season or on their backhauls, but if that overflow capacity disappears in the middle of produce season, it could be enough to affect dry van prices, Teets suggested. Teets? thesis is that freight brokerages will be forced to live on tightening margins in the future, so the strategy for Transportation One is to drive operational efficiencies to reduce overhead and increase broker productivity while doubling down on relationships. ?Now is a really important, telling time for us,? Teets said. ?The market couldn?t be better to identify who your true partners are. It?s not necessarily a good idea to take advantage of carriers.? Michael Feig, chief operating officer at White Plains, New York-based Capital Logistics, agreed with Teets? characterization of the market. ?The first quarter was very good on the margin side,? Feig said. ?Capacity was looser than expected. What?s interesting is that brokers are pricing everything like rates are going to keep going lower. I don?t know how much lower rates are going ? I don?t think that much lower, to be honest.? Already rates are starting to turn upward in the Southeast markets previously mentioned, as well as in southern California. 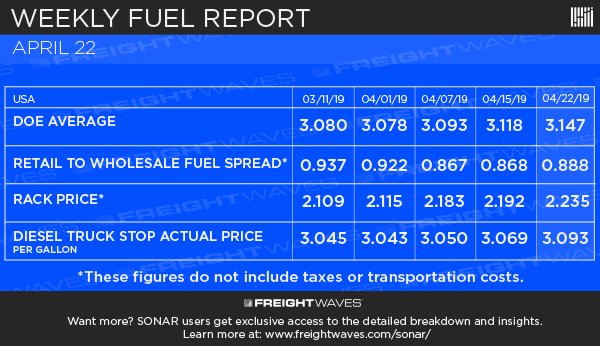 Dry van spot rates from Los Angeles to Dallas excluding fuel averaged $1.24/mile in March but jumped to $1.41/mile over the past seven days. As Los Angeles looks more attractive, Feig has been able to make good money on upstream moves. ?I think we?re starting to see lower rates out of the Midwest going into the West Coast because the West Coast is getting pricier,? Feig said. ?Rates have come back to earth a little bit in California, which is what we expected. The market has been favorable but we?re going to be there whether it?s tough or not.? 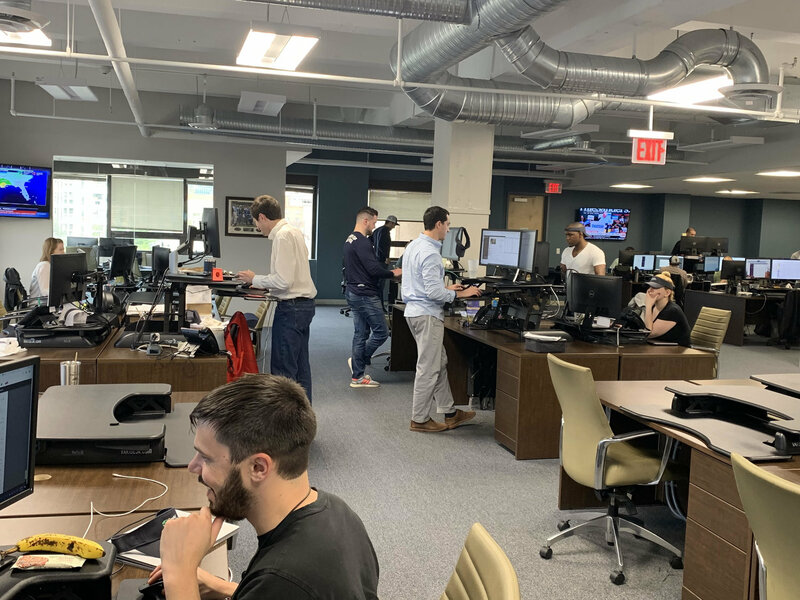 Capital Logistics has seen its dedicated team lanes out of south Texas move up 5 to 10 percent this week, Feig said, and they could keep going up. ?We?re in that lane every week with the same exact loads,? Feig said, ?so our fluctuation is a little less and we?re not going to go as low when the market bottoms out. May seems to be one of the most expensive times of year there.? Feig reiterated the need for a brokerage to have a thesis on the market driven by historical data and to keep from ?chasing the market? by quoting prices to shippers as if spot rates are going to continue falling. ?The biggest challenge is going to be who?s chasing freight at certain rates,? Feig said. ?I really believe the truth is somewhere in the middle [between third-party logistics provider and carrier bids]. I don?t think the bottom is falling out from here.? Ultimately the outlook for freight markets from here depends on two things ? supply (trucking capacity) and demand (freight volumes). Setting mixed macroeconomic data aside, Feig said that he did not think that small carriers were adding capacity at the same rate they had in 2018. New truck orders have fallen off precipitously now that enterprise carriers seem to have completed their replacement cycle orders. The number to watch is the average price for three- year old used trucks (UT3.USA), which has risen from approximately $55,300 at the end of October 2017 to $69,337 at the end of February 2019. If it?s true that capacity growth is slowing, used truck prices should fall as smaller carriers are no longer able to absorb the inventory cast off by the mega-fleets. Today on FreightWaves NOW, spring has sprung but there?s still weather to watch out for, and Donny gives us a micro and macro look at capacity and rates. The garage is about to become the largest parcel locker in America. E-tailer Amazon.com, Inc. (NASDAQ:AMZN) and Chamberlain Group, the maker of garage door openers and remote control devices, announced a joint venture to give Amazon delivery drivers access to residences by opening the garage door and placing packages inside it. The initiative is Amazon?s latest effort to service consumers who aren?t home to accept deliveries and who don?t want packages left outside the property. Deliveries can be executed either with a WiFi-capable garage door, or with an ?In-Garage Kit? that can be installed. Consumers who already have a WiFi-enabled door can use the service by connecting Amazon and Chamberlain accounts in the digital app of ?Amazon Key,? which manages the operation. Those opting for the kit installation can access the service through a digital hub that connects a standard garage door opener to the cloud, a special opener from Chamberlain, or either of the two services in conjunction with an Amazon ?Cloud Cam? that provides live feeds and motion clips at the delivery location. The ?Key App? allows users to check the status of their garage doors, and open and close it regardless of location, according to Amazon. Amazon customers wanting ?in-garage? delivery will check the button at checkout on the company?s site. On the day of delivery, the customer will be given a time window for the driver?s arrival. The customer will again be notified as the driver approaches the location. Using a hand-held device, the driver will request to open the garage door. The door opens, the driver places the packages in the garage, then requests the door be closed and locked. After the Amazon system verifies the package has been delivered to the proper address, the consumer will receive a final notification. A Cloud Cam will allow the consumer to view a video clip of the delivery. The ?Key? app enables Amazon drivers to gain access to customers? homes ? which include garages ? their cars and business locations to deliver packages if no one is there to receive them. That may help solve the problem that homeowners and townhome owners often face ? not wanting packages left outside their homes in public view. With Amazon?s new service, homeowners will not have to stay home from work to ensure they are there to accept a shipment. On her way out! 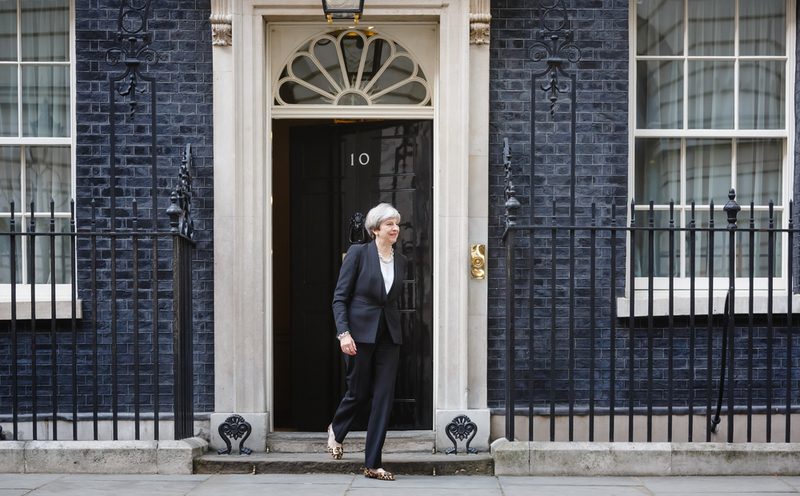 Theresa May could be leaving Number 10 Downing Street if her party colleagues manage to change the party rules and mount another challenge to her authority. Credit: Shutterstock.com. Prime Minister Theresa May has returned from her Easter break to find that hostile Conservative Members of Parliament (MPs) are stepping up their attempts to unseat her and elect a Brexiteer to the party leadership. Some party members are furious about May?s handling of the Brexit negotiations with the European Union and that she has entered into talks with the Labour Party leader Jeremy Corbyn, with these cross-party talks set to resume in the afternoon of 23 April. Nigel Evans, the joint executive secretary of the backbench 1922 Committee and the MP for the Ribble Valley in the northwest of England, said: "The only way we're going to break this impasse properly is if we have fresh leadership of the Conservative Party.? Backbench MPs will meet on the evening of 23 April to debate the possibility of altering the Conservative Party rules so that a new vote of confidence in the leader can take place. A challenge by the European Research Group of MPs in December 2018 failed to dislodge May from the leadership, but under current Tory Party rules another vote of confidence cannot be called for 12 months (mid-December 2019). Furthermore, the local Conservative Party associations, comprised of activists and party members, are also calling for an extraordinary general meeting so that a vote of confidence in May can be held. Party associations can hold a vote of confidence in the leader if more than 65 chairmen of the associations called for a meeting; that threshold has already been attained. However, a vote at an extraordinary general meeting would be non-binding on the Prime Minister. May is also facing pressure from two new parties that have been launched and that will contest the European Parliament elections, if they are held (in the United Kingdom) on 23 May. Nigel Farage, formerly the leader of the United Kingdom Independence Party (UKIP) has launched the Brexit Party and is tipped to take the votes of up to 40 percent of Conservative Councillors and other Tory voters. In addition, there are former Conservative and Labour Party MPs who left their respective parties to form the loose alignment of MPs known as The Independent Group. That group has now coalesced into Change UK, with former Tory MP Heidi Allen as the interim leader. Recent polls show that Tory voters could abandon the Conservatives if the European Parliament elections go ahead with both the Brexit Party and Change UK as major beneficiaries. One poll showed the Labour and Brexit Parties tied at 26 percent each if early voting intentions are to be believed. FreightWaves is providing a forum ? Market Voices ? for a number of market experts. Brian Laung Aoaeh writes about the reinvention of global supply chains, from the perspective of an early-stage technology venture capitalist. He is the co-founder of REFASHIOND Ventures, an early-stage venture capital fund that is being built from the ground up to invest in startups creating innovations to refashion global supply chain networks. He is also the co-founder of The Worldwide Supply Chain Federation (The New York Supply Chain Meetup). His background covers the gamut from scientific research, data and statistical analysis, corporate development and investing for a single-family office, and then building an early-stage venture fund from scratch ? immediately prior to REFASHIOND. He earned a BA with a double major in mathematics and physics. He holds an MBA. He also is a charter holding member of CFA Institute. Amazon has changed the retail business. It has changed the cloud computing business. It has also changed the supply chain business, but perhaps not in the way that you think. On April 9, 2015, Amazon published a blog post on the AWS Blog ? ?Introducing Amazon Machine Learning.? In the time since, sophisticated artificial intelligence capabilities and tools that make it easy for non-experts to deploy powerful models to solve business problems that were intractable until now have become part of Microsoft Azure, Google Cloud and other public cloud computing services. According to a 2018 report by Stratistics MRC, the market for Machine Learning as a Service (MLaaS) is expected to increase at a compound annual growth rate of 41.2 percent, moving from $679.32 million to $7.62 billion between 2016 and 2023. For the first time, technology startups building innovations that rely on supply chain data can utilize and deploy sophisticated Deep Learning, Natural Language Processing, Speech Recognition, Computational Learning and Real-time Simulation at a fraction of the cost it used to require just to get started. Concurrently, advances in microprocessor technology have led to a scenario in which data can be collected, analyzed and used to make critical decisions at the point of use ? even in situations where poor internet connectivity makes communication between edge devices and public cloud services impossible, at relatively minimal cost. The graph below shows the growth in the number of connected devices globally, from 15 billion in 2015 to an estimated 75 billion in 2025. Before 2015 logistics network optimization was only possible for the largest, most sophisticated companies. Since 2015, that has changed. 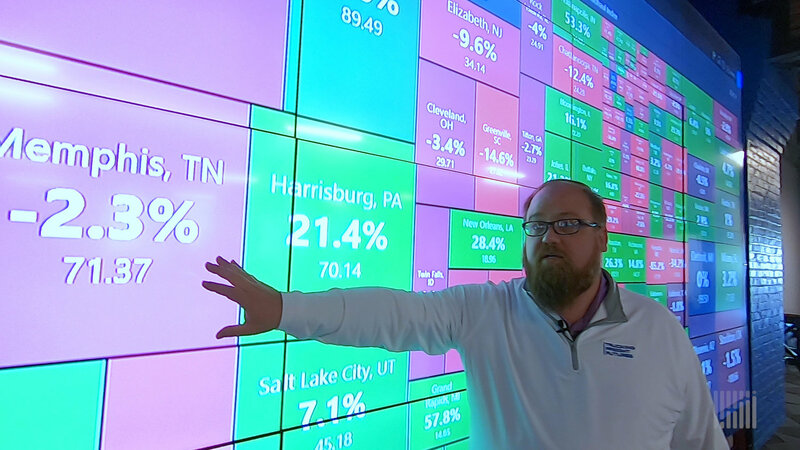 Supply chain logistics networks can now be optimized in real-time, based on proprietary and non-proprietary data, and used to render a decision in a fraction of the time, and at a fraction of the cost it would previously have taken. This development has led to the beginning of a new era in supply chain management. We are moving out of the age of transactional supply chain management and into the age of cognitive supply chain management. Transactional supply chains are characterized by: a narrow focus on discrete tasks that optimizes processes rather than end-to-end outcomes; static and siloed data that is refreshed at relatively long intervals; local optimization that does not account for global conditions throughout the supply chain network; and reactive decision-making that is also relatively slow. In contrast, cognitive supply chains are characterized by: a focus on optimizing end-to-end outcomes within the supply chain network; data that is dynamic, refreshed in real-time and collaborative; global optimization; and adaptive decision-making that accounts for the cadence at which business operations occur. Of the 251,774 manufacturing firms in the U.S. as of 2015, 98.5 percent have fewer than 500 employees and are considered small. (Source: National Association of Manufacturers. Author?s calculations.) This is the opportunity; the portion of that population that is big enough to purchase supply chain network optimization software, but too small to build its own. According to ?How Online Marketplaces Can Power Employment in Africa,? a BCG report, ?The cost of getting a product from the factory to an end user within Europe adds around 90 percent to that product?s manufacturing cost. In Africa, logistics adds an average of 320 percent to a manufactured good?s cost.? Consider the implications of supply chain network optimization in all regions of the world. The opportunity is even more exciting when one realizes that manufacturing is only one of the sectors in which this transformation is taking place. Every aspect of economic production and consumption will be affected by this shift from transactional to cognitive supply chains. This is why startups building new supply chain logistics software have captured the imagination of venture capitalists recently, leading to the 25x growth in the amount of capital that venture capitalists are deploying in freight tech startups. Some of them are building proprietary products that they use to run their own captive businesses. Others are building platforms that enable their customers? businesses. That distinction is less exciting than the possibilities this ongoing transition offers investors and entrepreneurs. FreightWaves Radio?s ninth national show was broadcast on Saturday, April 20 on SiriusXM?s Road Dog Channel 146. 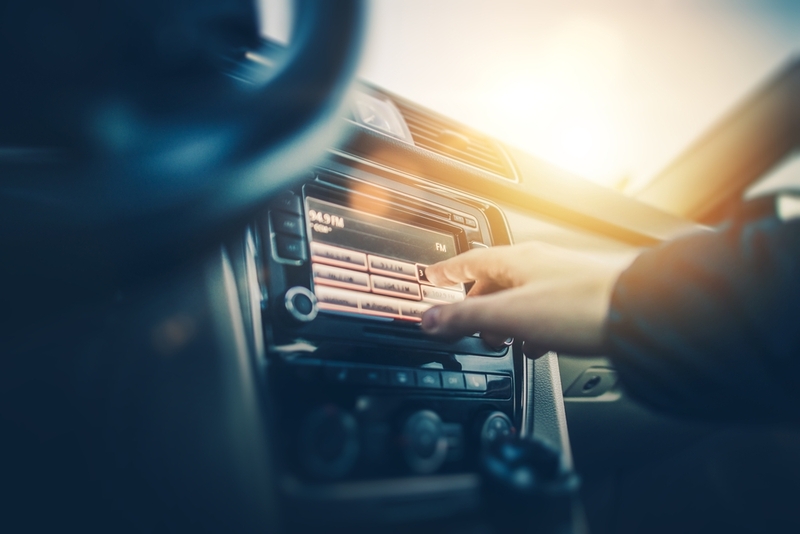 Unlike other industry-specific radio shows that often have particular messaging or lobbying aims, FreightWaves Radio is an independent, data-driven look at what?s really going on in the freight world, and the episode proved just that. Hosts Chad Prevost and John Kingston kicked things off from both the SiriusXM studios in Rockefeller Center in downtown Manhattan, and from the Freight Alley studio in Chattanooga, Tennessee. ?The drug and alcohol clearinghouse will have some impact on capacity. I certainly don?t want to overstate it. When you look at the most recent numbers, less than 1 percent of drivers test positive for drugs and far less than 1 percent ? one-quarter of 1 percent ? test positive for alcohol. They?re very small numbers at least from current testing methods. So, will there be an impact on driver supply and capacity? Yeah, there will be. The drivers that have been getting through the loophole will not be getting through the loophole.? ?ELDs [electronic logging devices], those are coming. That grandfather clause is ending. I hate to sound ominous, but making that transition now, it?s time to start because being behind the eight ball. If you haven?t found a device to solve your logging problems, it?s time to get started. Whether it?s a hardware change or a software, you name it, those things need to happen beginning now.? ?In the late ?90s I lost a couple of drivers running an operation and it?s one of those life-changing experiences when you have to go to a family and say, ?You?re husband?s been killed in an accident.? I knew both of those drivers fell asleep, but I didn?t know why, and through a series of connections I ended up working for a Harvard professor in Boston, and I learned about human physiology, and it occurred to me what had happened to those drivers is that they?d had a micro-sleep event without even realizing it had happened.?
? [Precision-scheduled railroading] is an inwardly-focused financial strategy. It?s all about short-term optimization of an individual railroad. The scary part of that is that the railroad industry is a very long-term, strategic business. Precision-scheduled railroading is a very short-term focused financial strategy.? ?It?s true that it?s time for freight rates to start trending up, but they haven?t so far. We?re seeing a little more flatness in the market this year. Right now we?re not necessarily seeing a big uptick in the market yet. April has pulled back a little from March. Rate pressure may be in its early stages.? The FreightWaves Radio show will keep on coming live to you each and every week from 3:00-5:00 p.m. EDT on SiriusXM?s Road Dog Channel 146. If you can?t tune in then, the show is also replayed on Saturday from 9:00-11:00 p.m. EDT and then again on Sunday from 7:00-9:00 p.m. EDT. Also, the show is available for two weeks via SiriusXM?s on-demand feature. Join the discussion on all things freight and see how so much connects to transport and the movement of goods. Elon Musk, the CEO of Tesla, while speaking at an invitation-only event for investors at the carmaker?s headquarters in Palo Alto, California, claimed that Tesla is on the verge of introducing self-driving cars, hinting that it can happen as quickly as the end of this year. His usual flamboyant self, Musk said that it is ?financially insane to buy anything other than a Tesla? and criticized the concept of LIDAR (Light Detection and Ranging) ? the device that senses activity in a driving environment ? saying it is a ?fool?s errand? to pursue that technology. Musk has had a long history of overpromising on Tesla?s product capabilities, and reactions to the new claims have been met with skepticism as well. For one, trashing LIDAR, until now an integral part in the visual arsenal of a self-driving car, has not gone down well within the autonomous landscape, as virtually every frontrunner in the niche is using LIDAR to good success. Musk?s insisted that Tesla?s new microchip is objectively the best chip in the world, and that by mid-2020, Tesla?s autonomous capabilities will have improved so much that drivers will no longer need to pay attention to the road. If this statement holds, Tesla's self-driving cars will meet the requirements of SAE Level 5 autonomy ? a technology that can make a vehicle navigate without human help across all driving environments and situations. Google?s Waymo and General Motors? Cruise Automation are among the leaders in the self-driving space, and even with their sophistication and the thousands of hours their self-driving automobiles have clocked on the road, it is unsure if fully autonomous vehicles will see widespread use in the near future. Though Waymo does offer rides to a limited number of test passengers in the Phoenix region, the cars always come with a human behind the wheel, ready to take control in case of an emergency or unforeseen situation. In the present setup, what is feasible is for self-driving companies to deploy vehicles with Level 4 automation, in which the vehicle can make decisions in situations when human drivers do not respond in time. This could be done across geofenced locations like interstate highways where the possibilities of pedestrians and stray vehicles are more remote. Leaving aside the question of whether Level 5 automation is even possible, Musk?s claims about Tesla having a self-driving car in just over a year look to be highly improbable on the current roadmap to driving autonomy. The only thing in Tesla?s favor is the number of cars it has sold across the world. This quarter, Tesla is expected to have a total of 500,000 cars on the road, from which the company collects driving data that is used to improve the predictability of Tesla?s neural networks, helping steer the self-driving car. Nonetheless, it would all be pointless unless Tesla can prove without question that its cars can drive without help across every situation. Musk also stated that Tesla is looking to introduce robotaxis. ?A year from now, we?ll have over a million cars with full self-driving software,? he said. Tesla?s idea is to create a business model in the on-demand taxi hailing market that incumbents like Uber and Lyft envision ? running self-driving taxis. Running automated taxis in the market would mean cutting out the taxi drivers ? who comprise a huge percentage of taxi-hailing operations and costs. Automation will slash ride charges, giving the company that commercially deploys self-driving taxis a massive edge over its competitors. Tesla plans to introduce an application wherein Tesla owners can opt-in on generating revenue by renting out their cars for the on-demand taxi market when they are not in personal use. Tesla is looking to take a cut of 20 to 25 percent per successful ride, which would significantly boost its revenue. Musk did casually admit that there might be a few ?fender bender? situations, implying that people might get hit if conditions go awry. However, he was quick to acknowledge that Tesla would be held liable for any accident that happens on the road caused by a vehicle that is controlled by its autonomous driving system. All this being said, Musk?s tall predictions come right before its quarterly earnings report, which is expected to be below expectations as the company has had a disappointing few months of car sales. This has led Tesla?s stock to sink 5 percent this week to $262.75 per share. Going by all of Musk?s claims that have routinely failed to hold water, it remains to be seen if this announcement lives up to its promise, or if it will go down as yet another assertion not based on actual results. The Procter & Gamble Company (NYSE: PG) beat analysts? expectations on both earnings per share (EPS) and net sales in the third quarter of fiscal year 2019. The company reported net sales of $16.5 billion, up 1 percent year-over-year and ahead of analysts? $16.34 billion estimate. Diluted net EPS came in at $1.04, up 9 percent from the same quarter in 2018. Core EPS climbed 6 percent to $1.06, beating estimates of $1.03. Currency-neutral core EPS increased 15 percent year-over-year. The company attributed the rise in core EPS to an increase in net sales and a lower effective tax rate. Those benefits were partially offset by a reduction in operating margin, due primarily to negative currency and commodity cost impacts, according to the company?s earnings release. P&G has beat earnings estimates every quarter for the past year. ?We delivered another quarter of strong organic sales growth, enabling us to further increase our outlook for the year,? David Taylor, chairman, president and CEO of P&G said in the earnings release. ?Cash generation also remains strong, supporting an increase in our cash productivity target and extending our long track record of dividend increases. Our focus on superiority, productivity and improving P&G?s organization and culture is delivering improved results despite a challenging competitive and macroeconomic environment.? While net sales were up 1 percent year-over-year, organic sales increased 5 percent, thanks to a 2 percent increase in organic shipment volume, according to the company?s earnings release. Pricing also added 2 percentage points to organic sales. Organic sales exclude the impacts of foreign exchange, acquisitions and divestitures. Beauty segment organic sales showed a 9 percent increase over the same quarter last year. Skin and personal care organic sales showed the strongest growth in the segment, which the company attributed to premium innovation, positive product mix from the disproportionate growth of super-premium SK-II brand and increased pricing. Grooming segment organic sales fell 1 percent year-over-year. The sale of grooming appliances decreased mid-single digits due to negative mix impacts from the disproportionate growth of mid-tier products, according to the company. Organic sales in the company?s health care segment increased 5 percent year-over-year. Oral care organic sales and personal health care organic sales both increases mid-single digits. The company attributed the spike in oral care sales to strong volume growth and positive sales mix in developed markets driven by premium toothpaste and toothbrush innovations, while the growth in personal health care was due to devaluation and innovation related price increases. The acquisition of Merck OTC caused all-in sales to rise double digits in personal health care. The fabric and home care segment experienced a 7 percent rise year-over-year, driven by fabric care organic sales. As in other segments, the company attributed this growth to innovation, increased pricing and positive mix due to the disproportionate growth of premium products. The company?s baby, feminine and family care segment saw a 2 percent increase in organic sales year-over-year. Feminine care sales increased high single digits, while family care sales rose mid-single digits. However, these increases were offset somewhat by a low single digit decrease in baby sales. P&G attributed the drop to competitive activity and market contraction. Reported gross margin increased 30 basis points. Core gross margin was unchanged year-over-year, including 60 basis points of negative foreign exchange impacts. ?Operating profit margin decreased 10 basis points versus the base period on a reported basis including approximately 60 basis points help from lower non-core restructuring charges,? according to the report. ?Core operating margin decreased 60 basis points including 100 basis points of negative foreign exchange impacts. On a currency-neutral basis, core operating margin increased 40 basis points including total productivity cost savings of 260 basis points for the quarter.? The company issued a soft outlook, predicting fiscal 2019 all-in sales growth in the range of in-line to up 1 percent versus 2018, including a negative impact of 3 to 4 percentage points from the combination of negative foreign exchange and a modest positive impact from acquisitions and divestitures. The company maintained its guidance on the bottom line, expecting diluted EPS to rise 17 to 24 percent year-over-year. Core EPS are expected to climb 3 to 8 percent in fiscal year 2019 over 2018. P&G expects to pay over $7 billion in dividends and repurchase approximately $5 billion of common shares this fiscal year. The company?s stock was down 1.91 percent in pre-market trading on Tuesday, April 23. In the earnings report released April 23, the telecommunications giant reported revenues of $32.1 billion, compared to $31.8 billion in the first quarter of 2018. The increase is due in large part to the success of the company?s wireless division. Verizon?s net income was $5.2 billion in the first quarter. EBITDA (non-GAAP, earnings before interest, taxes, depreciation and amortization) totaled around $12.2 billion, a 2.7 percent increase year-over-year, and its consolidated operating income margin was 24 percent. Consolidated EBITDA margin (non-GAAP) was 38.1 percent in the first quarter of 2019, compared with 36.4 percent in the same quarter of 2018. The company?s service revenues rose 4.4 percent during the first three months of the year, despite a decrease of 44,000 in net phone subscribers. Verizon reported 61,000 additional retail net postpaid additions, including 174,000 postpaid smartphone net additions. ?Verizon began 2019 by extending our leadership position in 4G, driving innovation in 5G and expanding our high-valued customer relationships,? Chairman and CEO Hans Vestberg said in the report. ?2019 is shaping up to be an exciting year for Verizon. We are leading the world in the development of new technologies with the launch of our 5G Ultra Wideband network. Our ambition remains unchanged to provide the most advanced next-generation networks in the world.? Verizon shares were 1.1 percent higher in pre-market trading immediately following the earnings release, indicating an opening price of $58.73 per share. The quarter instilled optimism in the company, leading to a prediction of continued growth throughout the year, according to the report. ?The company expects low single-digit percentage growth in adjusted EPS, excluding the impact of the new lease accounting standard,? the report says. ?This is an increase from prior guidance for 2019 adjusted EPS to be similar to 2018, excluding the impact of the new lease accounting standard.? Research recently released by industrial real estate firm CBRE showed that the first quarter availability rate for United States industrial real estate, for the first quarter of 2019, was essentially flat, falling by less than half of a basis point to 7.0%, while demand for warehouses was largely in line with the delivery of newly constructed supply. The ATA?s advanced seasonally-adjusted (SA) For-Hire Truck Tonnage Index for March, at 113.2 (2015=100) was down 2.3%, following a 1.5% February decline, to 115.8, which was downwardly revised from an original reading of a 0.2% decline. For February, the most recent month for which data is available, the TCI was 1.71, down from January?s 5.79. December?s reading was 11.46, which marked a significant increase over November?s 5.84 and October?s 3.17. FTR said strong sequential volume gains, as well as a favorable fuel environment paced those growth levels at that time. With a 2.7-cent increase, this week?s average is $3.145 per gallon. This gain was preceded by a 2.5-cent gain last week, to $3.118, ahead of the week of April 8, which came in at $3.093.